I think I'm addicted to crumble. 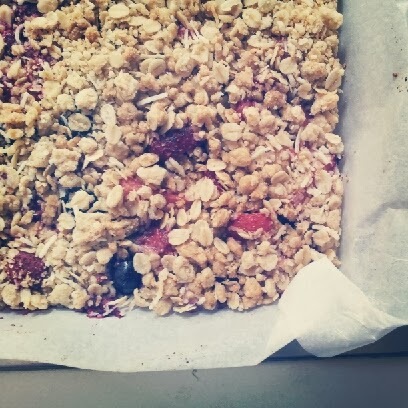 Actually to rephrase I'm addicted to Heidi's crumble topping featured in her cookbook Super Natural Everyday. It's actually so amazing that I've eaten it straight from the bowl, freezer, during baking, sneaking it from other peps' plates- it's addictive. In the past week I made 2 batches and used it to cover baked peaches, ice-cream and this berry crumble slice. The only adjustments I make are adding a handful of shredded coconut and using a little less sugar. Preheat the oven to 170 degrees Celcius, fan-forced. Mix flour into creamed mixture. Remove from oven and base to cool for 5-10 mins. 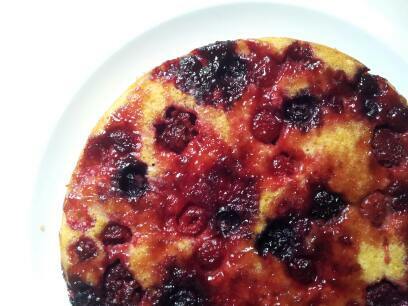 Top with a layer of jam and enough berries to cover the base and the crumble topping. Bake until the crumble is golden. Upside down cakes have always been one of my favourites. I trace the fascination back to when I first laid eyes on the classic pineapple and glace cherry combo in my year 8 home economics class. I can't even recall the taste of that cake and I'm guessing it's because I never even tried it. I blame the glace cherries. I've never been much of fan of those sickly sweet, squeaky textured little red and green balls. It must be genetic. Every year for Christmas and Easter our Nonna makes these little round cinnamon biscuits which she decorates with a glace cherry in each centre. Everyone in our family picks off the cherry and yet she insists on continuing to use them as decoration because...wait for it..." it looks good for the visitors." I admit she does have a point. 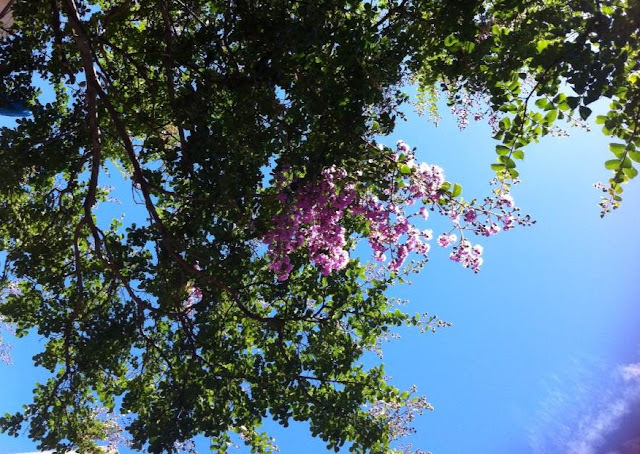 It's probably the reason why they were included in the classic pineapple upside down cake and perhaps the reason behind my love of upside down cakes. It's all about appearance. There's something magical each time you turn over the tin. It's the surprise of what lies underneath. Something shiny, glossy and simply gorgeous. And that's why I don't think I could ever get sick of upside down cakes, unless of course they are adorned with glace fruit. This particular cake is no exception. While it bakes, it fills the house with the comforting aroma of honey. 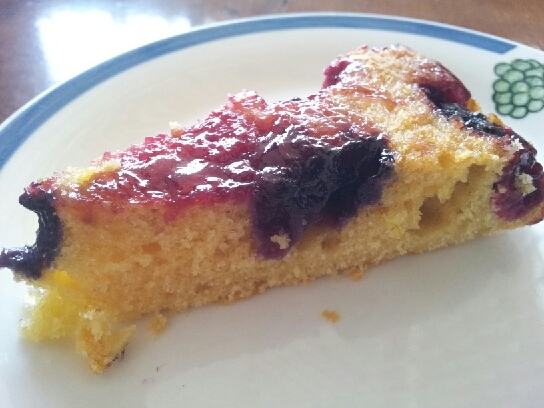 The cake itself has a soft, moist crumb which is neither oily, nor too sweet, and the berries are a great match for the prominent honey flavour. Just the right accompaniment to a cup of tea. Adapted from a caramelised apple upside down cake featured in Food, Heart, Life, a Unilever Australia Ltd. publication. Preheat the oven to 180 degrees Celsius. Grease the sides of a 20cm round cake tin with butter/olive oil spread and line the base with baking paper. Spread the jam over the base of the tin. You may have to squash the jam down using the back of a spoon. Grate the lemon and sprinkle a pinch of the zest over the jam. Reserve the remaining zest for the cake batter. Squeeze the juice of half a small lemon over the jam. Arrange the frozen berries over the jam/lemon mixture. In a bowl use a whisk to mix the olive oil spread/butter, egg, milk and honey. Don't worry if the mixture appears lumpy. Sift in 1/3 cup of the flour and add the salt, lemon zest and juice. Gently mix using a whisk to remove any lumps. Use a spatula to fold in the remaining flour. Using the spatula, dollop the mixture over the berries then gently smooth the mixture so that you have a flat/even layer of batter over the berries. Bake on the middle shelf of the oven for 20-25 minutes or when a skewer inserted into the middle comes out clean. Another trick to check if the cake is done is that it should spring back to the touch. Cool for 5 minutes on a cooling rack before turning out of the tin. This step is important as it allows the berry topping to set. Helen was my Pre-Primary teacher. I remember she had a birthday box that she would bring out when it was one of our birthdays. We were allowed to choose a gift and I remember choosing a kinder surprise, which would have to be one of my favourite chocolates, just for the surprise inside. This cake is just like that. It may look like a simple chocolate cake, no different to any other, but I assure you when you take a bite it takes chocolate to a whole other level. There are three flavour options; plain chocolate, chocolate and espresso or chocolate, espresso and whisky. My personal favourites are the later two. The cake is deliciously moist and will keep well provided it's stored in an airtight container. The crumb is tender, though holds it's shape, which makes for beautiful slices to be served with cream (OMG- soo good). Have I also mentioned that it's a one pot wonder? 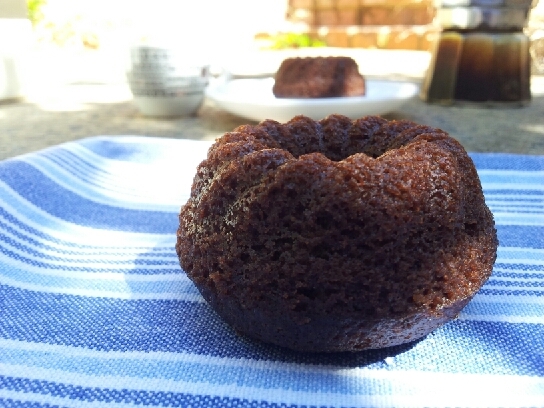 It also works well as a whole cake or cute little bundts like the one we made above. Then, take of the heat and allow to cool slightly before whisking in 2 eggs and 1 3/4 cup of self-raising flour. For a cake: Bake for approximately 40 minutes at 180 degrees Celsius. For smaller cakes such as muffins adjust the time accordingly. For bundts, baking time is approximately 10-15 minutes. So if your feeling a little spontaneous give this cake a go- it will be sure to surprise. We would love to hear any flavour combinations you come up with. 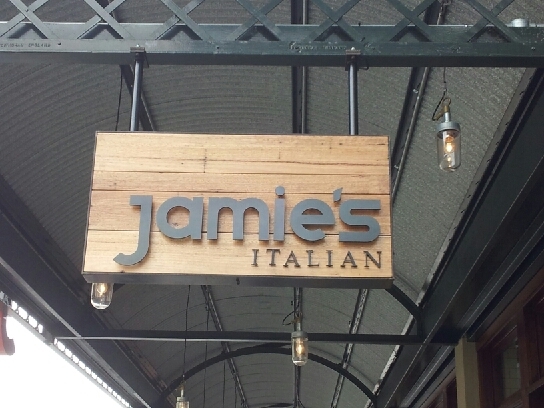 Happened to stroll by Jamie's in William St, Perth CBD. 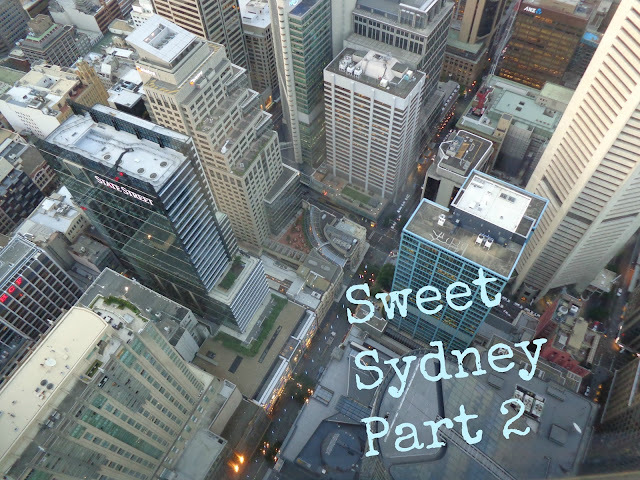 So recently we brought you part one and here's just a little more of our time in Sydney. This city has so much to offer and I will definitely have to visit again. I loved the city's natural beauty, bustling, busy streets, street performers and of course the food. 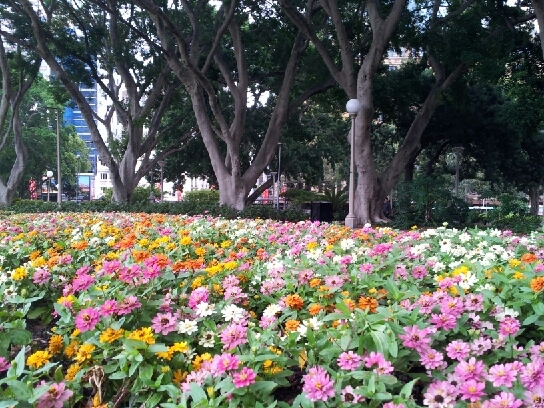 The perfectly manicured gardens of Hyde Park. Couldn't help but take a snap. Seriously massive cruise ships in Circular Quay. 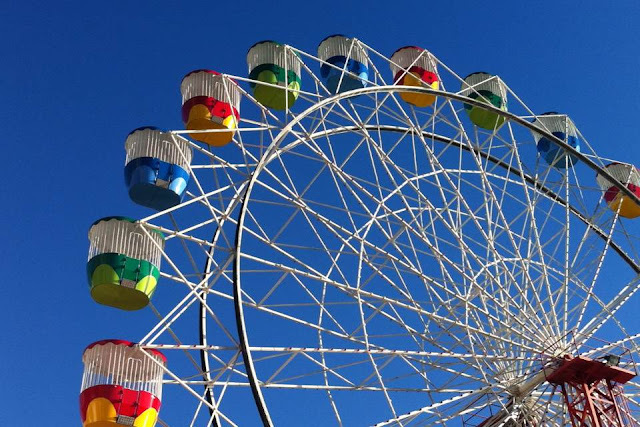 Rainbow of colour at Luna Park. Gorgeous trees in China Town. View from Centre Point Tower by dusk. Giant rubber duck by artist Florentijn Hofman for the 2013 Sydney Festival. I mentioned street performers. There are many but two really stood out for me. The above photo is the entertaining and talented contortionist Bendy Em. How does she do that??! Another (not pictured) is the amazingly talented Jack Dawson. Mum bought his album after a captivating performance in Circular Quay and she has played it every weekend since (Not kidding!). Go check out his music, it's fantastic. ﻿﻿Sorry about the many pics. I'll post photos of foodie highlights soon. Welcome to S'morish! Here you will find a stack of recipes that are super easy to make for a delicious treat that will leave you coming back for more!